It seems that I forgot to post these pictures of my Easter baked goods. 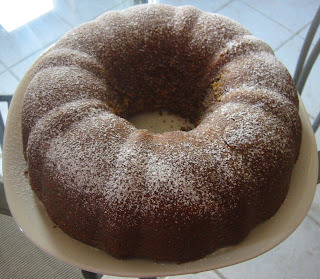 The first is Sour Cream Coffee Cake, from the KitchenAid cookbook. 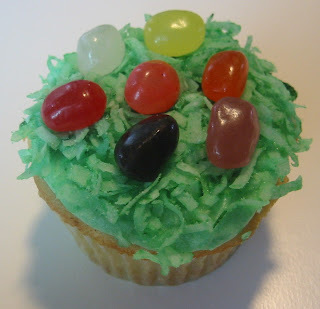 The second is one of the cupcakes that I decorated to look like an Easter basket with jellybeans as colored eggs and green-tinted coconut for grass. The cupcakes were basic yellow cake with buttercream frosting. The coffee cake was served after brunch and the cupcakes were dessert after dinner. Both were delicious and pretty. I separated the pictures as much as I could because they just looked weird next to each other. Either the cupcake looked giant or the bundt cake looked miniature.